Hang in there, fellow baseball junkies, we’re almost to Opening Day. But the dawn of baseball season does not excite every citizen of America, which, in the 21st century feeds its people instant gratification and action-packed leisure–two things that baseball lacks to the commoner. However, what all Americans undoubtedly love is FREE STUFF! So without further adieu, here is what even the most impatient, uneducated baseball observer can enjoy in 2014. Great Clips haircuts on April 9th: the St. Louis Cardinal’s site merely states that all fans will be able to get a haircut. No word on whether the haircuts will actually be conducted on site, or a coupon will be given for future grooming. On April 11th, St. Louis is handing out 25,000 Michael Wacha 2013 NLCS MVP bobbleheads! Bobbleheads are as much a part of the baseball tradition as peanuts, Cracker Jack, and freshly-cut grass, so any bobbly giveaway draws a crowd. The next day, redbird fans will receive a replica 2013 NL Championship ring. Again, no word on the details, but let’s hope the rings are at least made out of some sort of metal. If so, that will be a cool promotion! The Cardinals take the cake in early season giveaways. For a team with unspectacular attendance, the Seattle Mariners do not have a great promotional schedule, but there are a few highlights. May 30th… fedoras–20,000 of them! And the next night, the 31st, is a Robinson Cano bobblehead giveaway. Finally…socks! Mariners socks on June 25th. The Red Sox only have a bunch of fan photo days scheduled throughout the season, along with two bobbleheads in April. April 7th is David Ortiz and the 30th is Dustin Pedroia. The good news? Everyone in attendance gets a bobblehead, so there’s no need to run anyone over getting into the stadium. 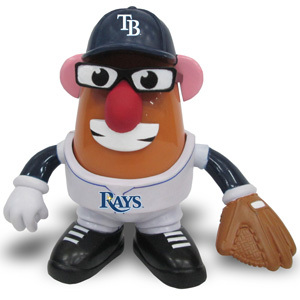 The Tampa Bay Rays have an interesting lineup of goodies. 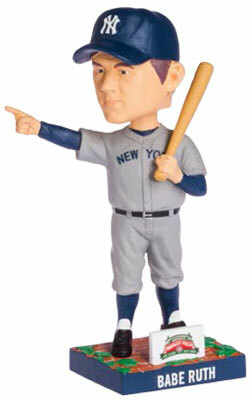 Wil Meyers has a Rookie of the Year bobblehead on April 5th…and a bike horn on August 3rd. How does one make a regular bike horn into a Wil Meyers bike horn? I guess we’ll find out in August. 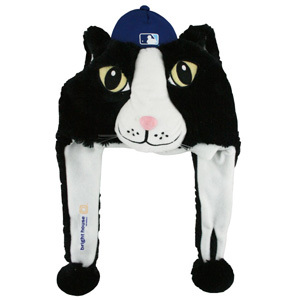 On May 10th, fans will receive a DJ Kitty plush hat (left). But I think the winner is the Joe Maddon Mr. Potato Head on August 2nd! I’m not sure the Marlins realize that promotions help fill seats because they are not giving anything interesting away this year. Then again, it could just be because no one wants to sponsor them. Alright, I’m of course most looking forward to the Nationals promotions because I’ll be attending most of my games in Washington. They’ve got a good bobblehead lineup going on, featuring Ian Desmond, Bryce Harper, Jordan Zimmerman, Wilson Ramos, and even a Racing President. But all the hype this year, I predict, will be for the Jayson Werth garden gnome on August 5th. 25,000 garden gnomes with Werth’s face! That’s exciting! In fact, the Nationals even named one of their mini ticket plans after the garden gnome! After more research, I discovered that the Nationals may not be the first team to dispense personell-inspired garden gnomes. 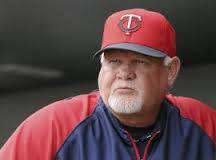 The Minnesota Twins are giving away the “Gardy Gnome” to the first 10,000 fans on June 7th. While this may just be a ploy to get fans through the gate when the Astros are in town, a manager Ron Gardenhire, “Gardy,” gnome will certainly impress. The Cubs have some quality promotions this year including a fedora hat and a model train. But the South Side’s most impressive offerings are the plethora of bobbleheads. Fan can receive a doll commemorating Babe Ruth’s “Called Shot” on May 16th, and one illustrating Greg Maddux’s 3000th strikeout on September 5th. Ernie Banks, Kerry Wood, and Joe Tinker, among others, will all have their own bobbleheads at Wrigley Field as well. And while all the knickknacks are fun and exciting, some of the best promotions happening around the league include Firework Fridays (presented by the Reds, Angels, Marlins, Rangers, and others ) and tasty evenings like Dollar Dog Night at Nationals Park. Every team’s promotional schedule is viewable on its site under the “schedule” tab. Enjoy it, fans.